alaTest heeft 102 reviews verzameld en geanalyseerd voor Kodak Pixpro FZ151. De gemiddelde beoordeling voor dit product is 4.4/5, vergeleken met een gemiddelde beoordeling van 4.0/5 voor andere Camcorders. We hebben de consumenten- en expertbeoordelingen, de leeftijd van het product en andere factoren geanalyseerd. Vergeleken met andere Camcorders krijgt de Kodak Pixpro FZ151 een alaScore™ van 86/100 = Zeer goed. 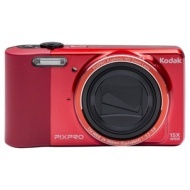 This is a great, easy to use camera at a very reasonable price. The optical zoom is fantastic. Have not used it a great deal yet but so far I am very impressed with it. My husband bought this camera for our holiday. It was just what he wanted and very good quality at a reasonable price. Assistant in the shop was very helpful. I bought this for my fiancees birthday and she absolutely loves it, a fantastic camera at a great price! Professional looking Camera,Easy to use. My son is photography mad and I bought this to replace an older camera that had broken on holiday.Very easy to use and with higher megapixels on both the camera and digital zoom the pictures are crystal clear.Video is good too. Cute but very heavy. Bigger than I thought from picture. Sent it back. Bought this camera to replace one that i broke by getting sand in it, this one is far better, and for a low price it far exceeds my expectations. I used my points (5=10) and so it only cost me £30,00. Wow- delighted. Thank-you. Camera really fine to hold, easy reach and fast responding controls.picture quality is so clear and natural loo. Love it.